Does Mom or Dad get enough to eat? Based on age and medical condition, is Mom enjoying a nutritional and high-quality diet? Is Dad relying on frozen pot pies for dinner every night, or does Mom think an apple enough for lunch? If so, it’s time to reassess. Nutritional requirements for seniors differ from younger adults, and studies have shown that less than 20% of seniors in the United States have access to a quality diet. Approximately 30% of seniors who are homebound miss at least one daily meal, and many are consuming less than 1,000 calories per day. An alarming 20% of the senior population is malnourished. 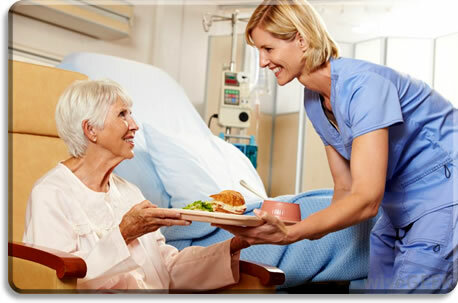 OptimumCare Home Care provides meal oversight, planning, and preparation. If you need someone to come in and cook for Mom or Dad on a daily basis or prepare entrées or side dishes ahead of time, it’s important to ensure that your loved one is getting not only enough to eat, but the right kinds of foods that ensure adequate calorie and liquid intake. Unfortunately, many senior households rely too heavily on processed and frozen foods. Those dealing with a lack of appetite due to medications or medical conditions is also a concern. Meal planning and preparation services not only ensure that groceries are procured and prepared for optimal quality and nutritional value, but that specialized dietary requirements based on conditions are being met. When you call OptimumCare Home Care for meal preparation or oversight for Mom or Dad, we take the time to provide individualized services that meet the needs of those diagnosed with specific requirements that include low-fat, diabetic, or cardiac diets. When we come into the home to help with meal planning, we’ll clip coupons, go through recipes, and shop based on our client’s preferences and food choices. Caregivers helping with meal preparation not only plan the meals but can go grocery shopping. They prepare the foods and ensure that they are properly packaged, labeled, and ready for serving. We also provide eating assistance and oversight as needed, and ensure that the kitchen and dining room is cleaned up before we leave. Adequate nutrition is essential for seniors. We know that caloric and nutritional levels change through the aging process. For optimal health and wellness, the right kinds of foods in the recommended dietary allowances and amounts will ensure that Mom or Dad stays as healthy and strong as possible.